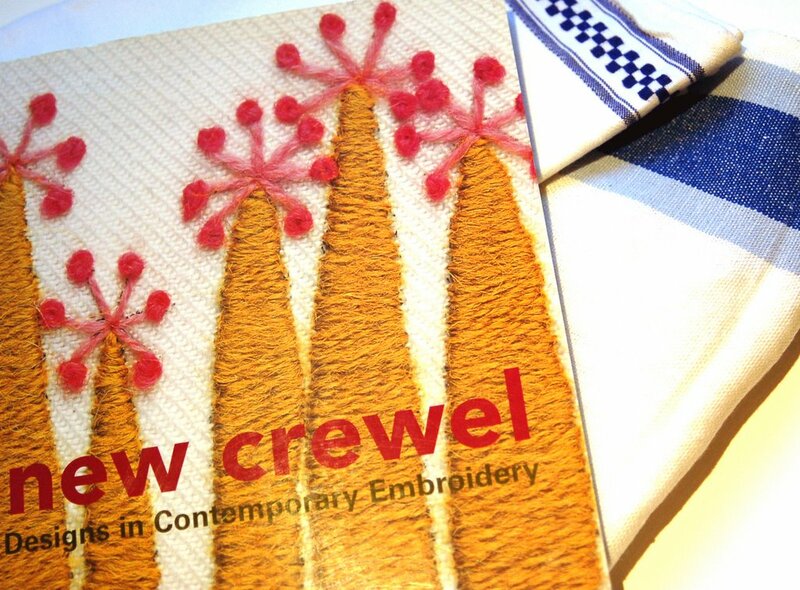 I picked up a copy of The New Crewel at the library last week. The New York Public Library doesn't generally have a strong selection of craft-type books in its lending selection, but somehow I managed to get myself on the list for this book just before it was put into circulation (much later than the actual publication date, mind you) and only waited a week or two for it to arrive. What a charming collection of contemporary designs! It's great to see a pastime like this come back into vogue. I'm finding inspiration in the simplicity and the spareness of the compositions and the shapes used in the designs. When I finish my sock (ooh, I'm sooooo close! I can hardly stand to put it down long enough to write this! ), I hope to do a little embroidery again in the evenings. I've been working on more baby gifts, and I've started experimenting with satin stitch initials on one drawstring bag for a baby who doesn't use his full name. But I have some tea towels that are waiting for embellishment. Actually, some of the tea towels will be transformed, via embroidery, into large cloth napkins (er, "serviettes" to some of you not in the States) for casual dining, which is about as fancy as we get at our house lately. The others will be embroidered to become, yes, tea towels! Tremendously exciting, I know. And I learned a couple of things from the book: first, I did not invent the idea of outlining in chain stitch before beginning to satin stitch a shape. Erica Wilson did it in her famous book, which I've been meaning to get for myself. 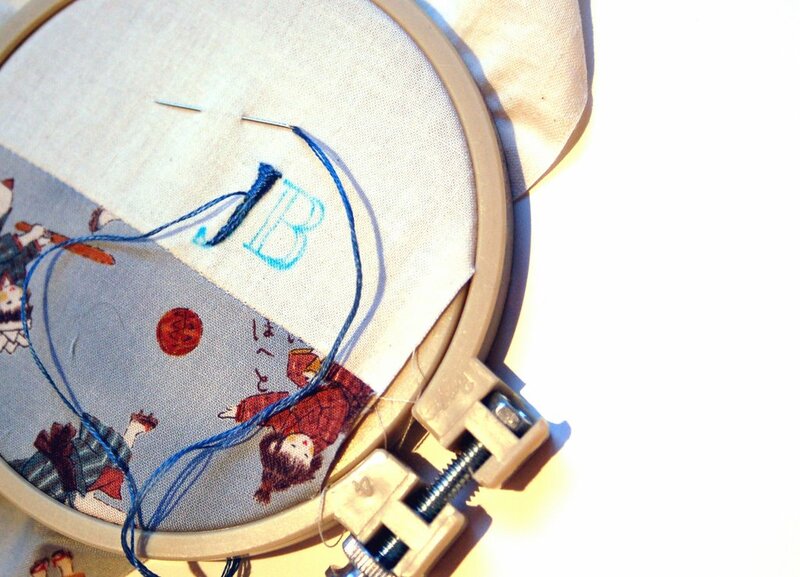 And second, it really does help to use an embroidery hoop. I dislike hoops passionately, but as you can see from the disdressed banner above, a hoop can prevent you from pulling your stitches too tightly across your work and distorting the shape and the fabric. Someday I'll need to either fix that banner or make a new one. I'm voting for a new one. Oh my this book has been on my wishlist forever but I have not ever seen inside the book so I am hesitant to buy. The cover is so yummy! How is it inside? Is it lovely inside as well? I would adore it if you get a chance to show us a few more interior shots but if not I totally understand. I assume that you are busy because I am positive that your assistant is on her way to my house as we speak! I can not wait till she gets here!!! I just love the baby gifts, you do a fabulous job with your embroidery. I have this book, and I love it! In fact, just yesterday I was staring at the pages AGAIN. It's totally worth the $. i love the distressed look of your banner, i think it goes great with the title. I think I must get this book - so many people have such favourable things to say about it. Your baby gifts are wonderful - I love the idea of everything co-ordinating and the embroidered name/initials are icing on the cake. 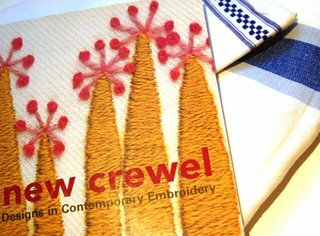 I have been lusting for this book for some time, I once saw some beautiful vintage crewel work and for years have had a plan to make some of my own at the back of mind...along with all those other things I want to make of course. that banner is perfect the way it is. I'm for keeping the banner. It has a certain energy because it isn't perfect: and these days anyone could photoshop a perfect one... I have that book, it's very interesting. Have just found your blog. Lovely work. And your thoughts about macrame and crewel make me feel old and wise too. As someone who once did those fiber things, I'm surprised & pleased to know that the next generation is picking them back up. As a librarian, I'm also happy to know that you're haunting the stacks for those old craft books. HURRAH!